From logos to retail locations, these businesses upped their image from so-so to stunning. We scoured the country for brands that underwent extreme makeovers and found five that looked great to us. Then we put them to the experts for the test. Here's what they said about the "afters"--and what you need to keep in mind when planning your own great makeover. 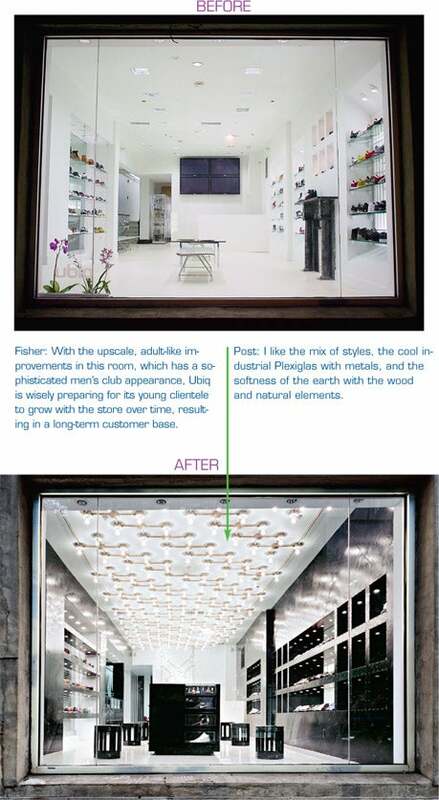 Behind the makeover: After Ubiq opened its Walnut Street location in 2004, Lee decided it needed a 2007 renovation more in line with the hip, urban feel of the $2 million athletic shoe and clothing retail brand. He worked with New York City design firm Architecture at Large to make the store feel like a cool place with a luxe attitude. Lynette Xanders: This redesign works for me. Both ends of the spectrum--industrial/modern and warm/rustic--seem to have been ramped up. However, I feel [like] the store experience is ungrounded in terms of tying the look and feel of the place to the brand: the icon, colors, tag line, etc. Jeff Fisher: Ubiq did a great job of recognizing the increasing sophistication of its target market and needs to implement subtle improvements over time to avoid having to do another major makeover in the near future. Karen Post: I wish this store were in my neighborhood. If hip and urban was the goal, the new environment tells that story. What's key here is that the décor and space are merely the foundation of this brand experience. What the employees are wearing, what the packaging is like and how it leverages the senses are the true glue. 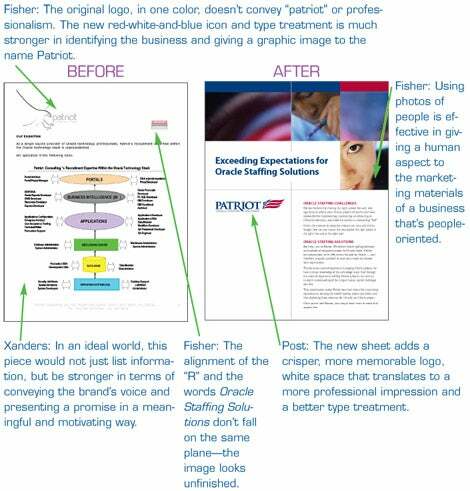 Behind the makeover: McIntyre and Zariello had a rudimentary sell sheet that didn't represent their brand well. It was cluttered and inappropriate for their corporate clients seeking IT professionals. They turned to Sagefrog Marketing Group in Doylestown, Pennsylvania, for help. Xanders: This makeover was successful. The revised collateral piece is much more inviting, readable and professional than its predecessor, which looked like a web page. More could have been done to reduce the density of the copy. In fairness, perhaps it's not the amount of copy, but how it's presented. Post: Print collateral has a role, but it can't win many big battles alone. Whatever you invest in print, make sure the same files are available to download on your website. Great branding is about consistent storytelling at all points. Strategic collateral that reinforces themes, stories, points of distinction and memorable messaging is still important. Behind the makeover: Tucker says the bullhorn image in the old logo "didn't represent collaboration as much as it did an individual voice. And it certainly didn't match the new product logos and corporate identity." 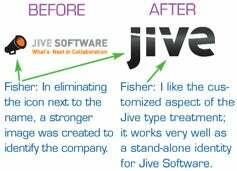 Because the company specializes in social and collaborative software, the logo didn't reflect the company's brand. After a false start, the company revisited the logo earlier this year, working with independent creative director Raja Sandhu. Xanders: This revamp succeeds because the take-away is visually clean, yet provides some elements of high-tech, warmth and movement, as a mother brand should. These mother brands need to be somewhat oversimplified to work with product brands and logos. Fisher: The original logo said little about any collaborative effort with the singular bullhorn image. There wasn't a strong connection between the bullhorn, the name and the tagline. The design came across as an icon slapped up against some text, with not a lot of relation between the two. Post: The new Jive brand ID is clean, contemporary and communicates a progressive organization. It's a common misunderstanding to equate a brand with a logo. The logo is a small piece of the brand. For this company to get the full benefit from a well-designed mark like this, it needs a supporting cast. Jive is a cool, hip word. All the copy and messaging associated with the brand needs to be consistent with this message. Other visual images need to feed this strategy and proclaim, "This is who we are and why we are the business you should choose." Behind the makeover: Comes' creative consultant had been bugging her for six years to redesign the website. "But we were growing at 30 percent per year," Comes says. "I was afraid to touch it." When a colleague told her that her print marketing was light-years ahead of her website, she decided it was time to take the plunge. With an upscale clientele that has more money than time, she purposely kept the design simple so the web page would load and function quickly. Website design was handled by independent creative director Tami Dickson and web design firm Colorado Web Solutions. Xanders: The redesign is far better. The visceral effect of reducing clutter and increasing the experience is always good. The product is the hero in this case, as it should be. 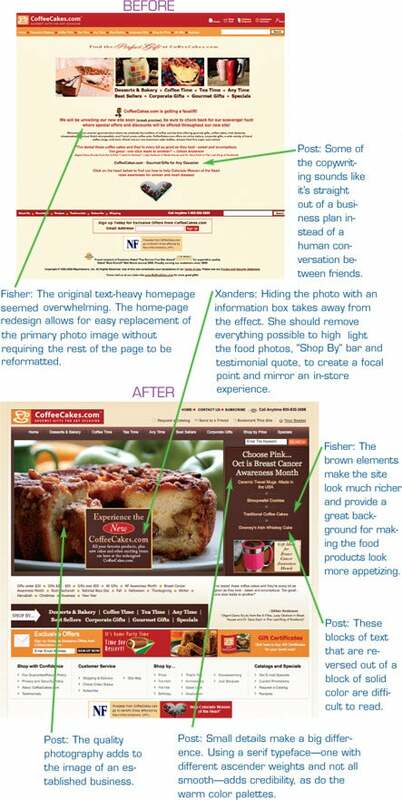 Fisher: They did a great job of not losing an established identity in the website upgrade. I don't think a lack of interactive features is a negative for the site. Too often websites are over-designed with too many special effects and bells and whistles, so the usability suffers. Post: Because this company is all about generating sales on the web, redesigning its website is a major brand evolution factor. The new look is appetizing and sends a strong message of trust from a friendly company. Behind the makeover: Kravetz and Spitalny had a booming $9.3 million specialty foods business on their hands, but their packaging didn't reflect their upscale products. They went to work on a redesign that Spitalny calls "definitely a success." At a recent consumer show in New York City, their sales were up 30 percent over last year. Lunabrand, in Scottsdale, Arizona, handled the redesign. Xanders: The old packaging played up [the enchanting theme] well, but it looked like fake or play food, which isn't ideal. The new packaging seems to have kept the handmade element and added some life. The icon should be present on all packages, as this is the key factor in building equity in the brand. 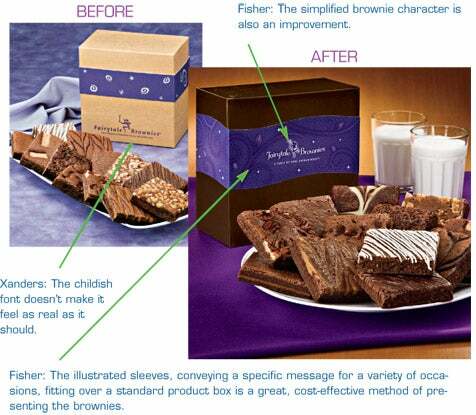 Fisher: I've received Fairytale Brownies as a gift in the past with the old packaging design. The previous design was effective but seemed to convey a somewhat down-home, organic image. The new brightly colored packaging presents that product line as a higher-end offering. Post: From a pure graphic design perspective, lighting up the whimsical and moving to a richer design style does look upscale, but the supporting and surrounding touch points (point-of-purchase displays, collateral, etc.) determine the full impact of the packaging on the brand.